I am a mom of boys. Three of them. And they love the stereotypical “boy stuff”– jumping monster trucks, digging up worms, and roughhousing. They are outside playing in the dirt as I write this. Therefore, I don’t get to experience the stereotypical “girl stuff” very often, except for when I get to bake and decorate for girls. I referred to last week as “Girl Week” in my head because all three of my orders were centered around girls. 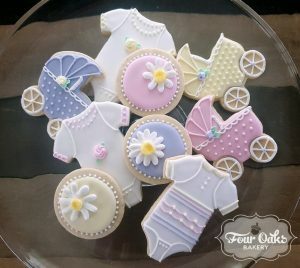 First, I made these lemon vanilla bean sugar cookies for a baby shower. 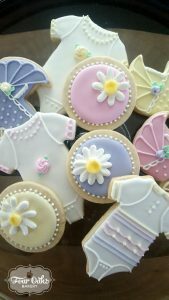 My customer requested onesies, baby carriages, and flower cookies in pastel pink, yellow, and purple to match the colors that her daughter-in-law used to decorate her baby girl’s nursery. I love doing cookie sets like this where there us a theme that ties the different cookies together. Later that weekend, another family was celebrating their baby girl’s very first birthday. Dad requested that the party’s theme be pink camo, but Mom (who ordered the cake) was hoping for a light pink, pretty cake. 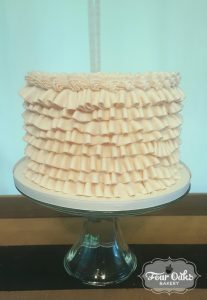 During our correspondence, we decided on a baby pink two tier cake with buttercream ruffles on the bottom tier. I am IN LOVE with these pretty ruffles! So delicate and lovely! This cake had a surprise inside, though! 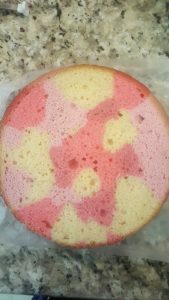 To play back to the party theme, we decided to make the vanilla cake, itself, in a pink camo design! Everyone was so surprised and Dad loved the special touch! I think that the juxtaposition of the pretty ruffled cake and the camo interior is so fun. 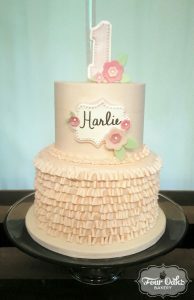 Harlie also received a special pink ruffle smash cake all to herself for her first birthday! So pretty and delicate. 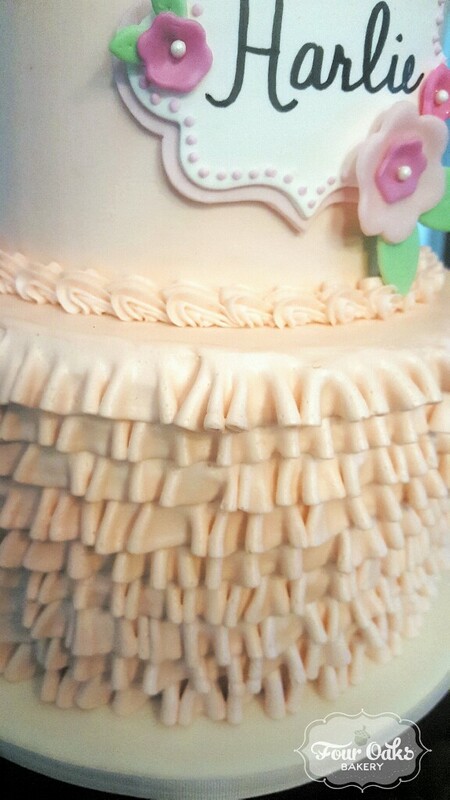 I can’t wait to do this technique on another cake!